A welcoming Cannock hotel with meeting rooms, a 12th-floor bar and free parkingHoliday Inn® Birmingham North - Cannock hotel is only a 30-minute drive from Birmingham city centre.The nearby M6 Toll motorway provides easy access to towns and cities across the West Midlands. If you’re catching a flight, Birmingham Airport (BHX) is half an hour away by car. We're within easy reach of Cannock town centre, where you can take in a show at the Prince of Wales Theatre. For a fun day out, take the kids to ride the roller coasters at Drayton Manor Theme Park or delve into the past at the open-air Black Country Living Museum, where costumed guides recreate life in a 19th-century industrial town. Business guests can host events for up to 180 people in our 5 naturally lit meeting rooms.At this hotel you can enjoy:- Free WiFi - A fitness centre- 24-hour room service- Kids stay and eat freeBright rooms feature a clean design and a pillow menu to help you get a good night’s sleep. For extra space, book a suite with a separate living room. Families can make the most of the multi-tiered soft play centre for kids and toddlers. The Sky Bar is the place to relax over cocktails as you take in sweeping views through floor-to-ceiling windows, and you can grab a bite from our Brasserie restaurant, open around the clock. 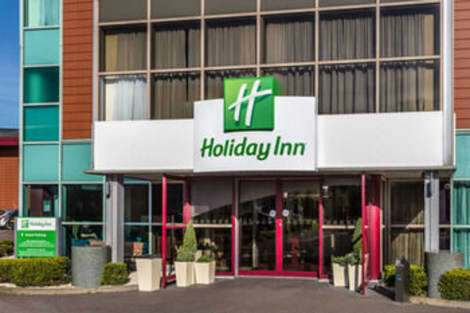 Located in Cannock, Days Inn Cannock Norton Canes M6 Toll is on a lake, within a 15-minute drive of Wall Roman Site and Cannock Shopping Centre. This hotel is 11.7 mi (18.8 km) from Wolverhampton Race Course and 12.2 mi (19.6 km) from Molineux Stadium. Satisfy your appetite for dinner at the hotel's restaurant, or stay in and take advantage of the room service (during limited hours). Quench your thirst with your favorite drink at the bar/lounge. A complimentary English breakfast is included. Cannock lies in Staffordshire in the West Midlands, which is a county boasting a great deal of idyllic scenery. Here you can enjoy ‘Cannock Chase Area of Outstanding Natural Beauty' at your leisure. Cannock Chase comprises 26 miles of beautiful, unspoilt countryside. Here you can find fascinating differences in landscape and wildlife, including rare and endangered birds and a herd of around 800 fallow deer. There are at least ten mapped walks in Cannock Chase, which range from one to 12 miles in length. The walks are gentle, relaxing and a marvellous way to take in the surrounding views. There are a number of visitor centres and museums on the Chase, and to the north-east Shugborough Hall, the Earl of Lichfield's ancestral home, can be found. At the south are the remains of Castle Ring, an Iron Age hill fort, which is the highest point on the Chase, at 794 feet. You can also find several glacial erratic boulders, remnants of glaciation, along the walks. The chase is home to two dedicated marked mountain bike trails, free and open all year round. You don't need to bring your own bike, either, as Swinnerton Cycles Forest Centre, resident on the Chase, offer a range of bikes to hire from as little as £20. You can also hire kids' bikes, trailers and ‘tag along' bikes, which attach to an adult's mountain bike. Book early as demand is high. For a unique, green way to enjoy the forest, try an hour of ‘off the beaten track' fun with self-balancing, all-terrain electric Segways. Remember to book early to avoid disappointment. Go Ape is all about getting out, having fun and being adventurous. There are two levels of Tree Top Adventure, in which there are tree-top high wires, tricky crossings (ladders, walkways, bridges and tunnels made of wood, rope and super-strong wire) and an unforgetSEOSITE_LEVEL_DESCRIPTION zip wire. Go Ape was awarded Silver in the Best Small Visitor Attraction category in the Enjoy Staffordshire Awards, 2014. The ultimate experience in horse riding and pony trekking, the centre provides off-road riding through the forest of Cannock Chase all year round. Whether your dream is a gentle walk through the picturesque landscape, pub treks or more exhilarating rides, the centre has it covered. Drayton Manor theme park, packed with fantastic adult- and kid-friendly rides and its very own zoo, is only around a 40-minute drive away. World renowned Alton Towers is around an hour away, as is the National Forest – another great area full of natural beauty. Be an engine driver for the day! The Foxfield Railway offers the thrill of firing and driving a full-sized steam locomotive, or perhaps you simply want to ride on the footplate and let someone else do the work. Both these dreams can be realised at Foxfield Railway, just 23 miles away from Cannock. Cannock offers a great range of restaurants, and one or two clubs for those who fancy dancing the night away. Georgios is an atmospheric, pretty little Greek restaurant which serves traditional Greek fare. For a lovely welcome, perfect lighting, great music and Indian food, try Spices on Walsall Road in Cannock. Bar Sport shows live sports all day every day, on multiple giant screens in a stylish environment. It has an exceptional menu, and fresh food is prepared every day. We're sure you'll agree that Cannock is an absolute gem of a centre for a family getaway.